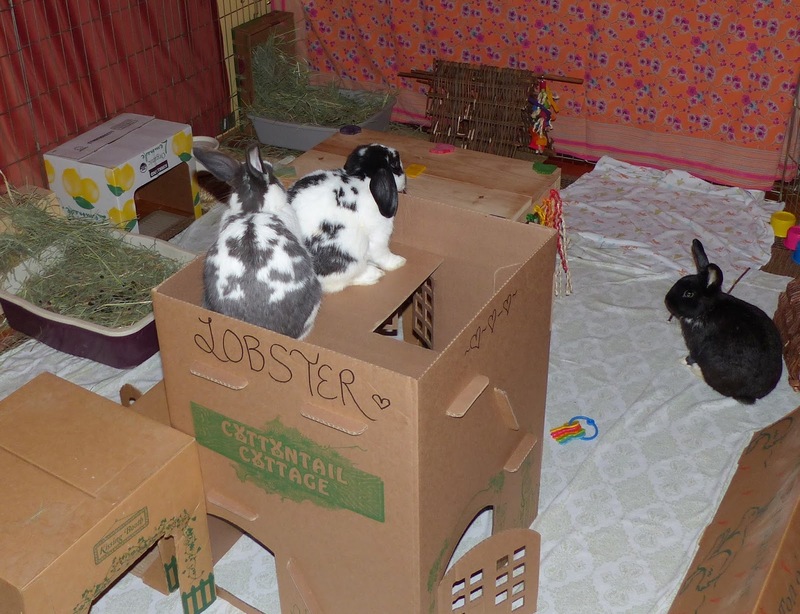 Lobster relaxing on the rooftop of his cottage. 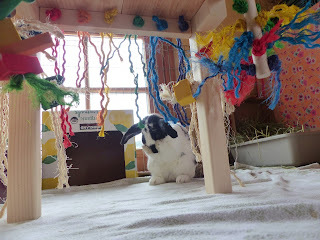 He definitely likes this spot! 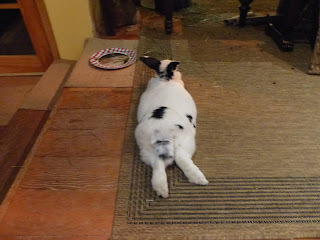 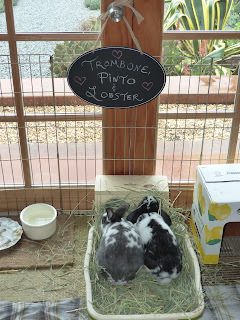 Trombone doing the bunny "loaf". 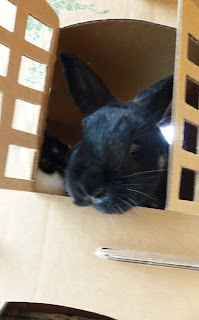 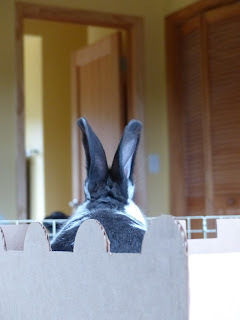 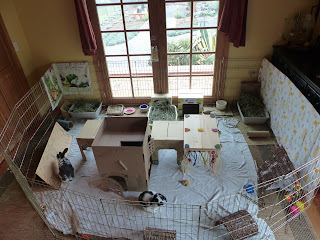 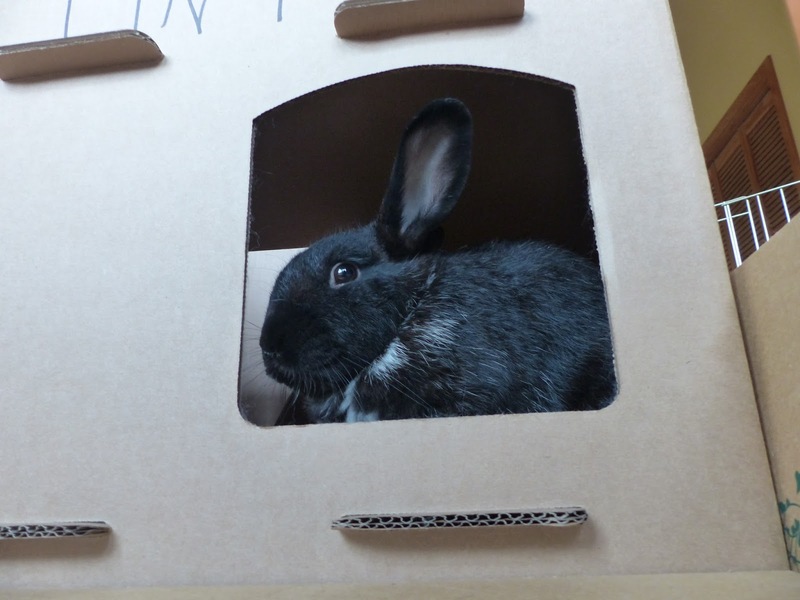 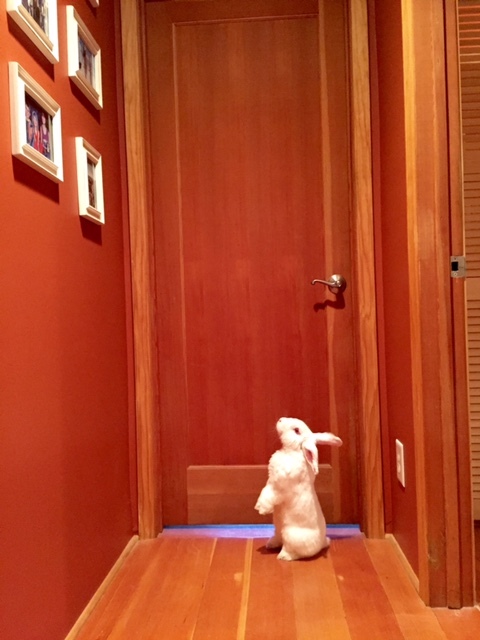 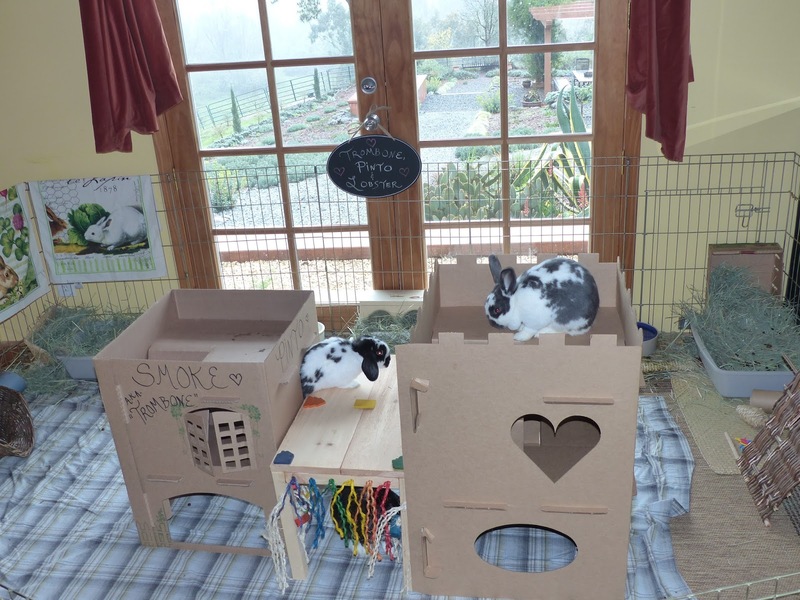 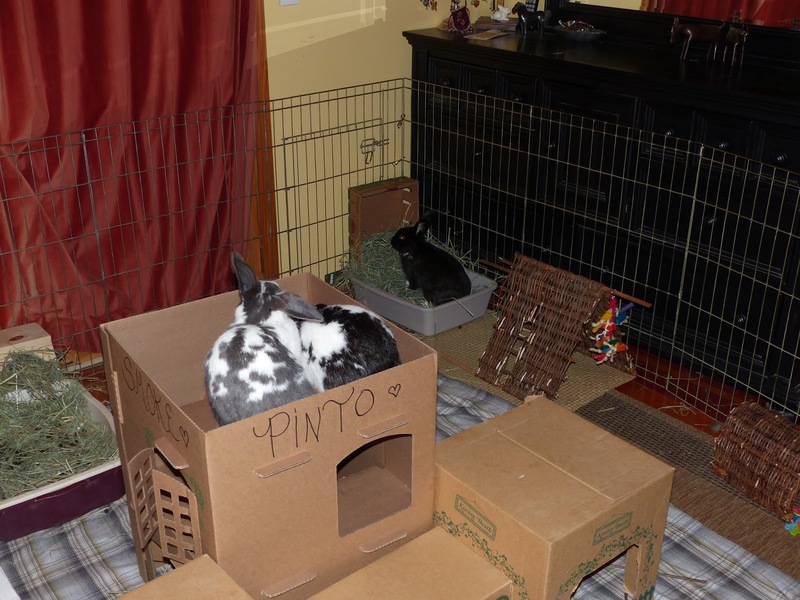 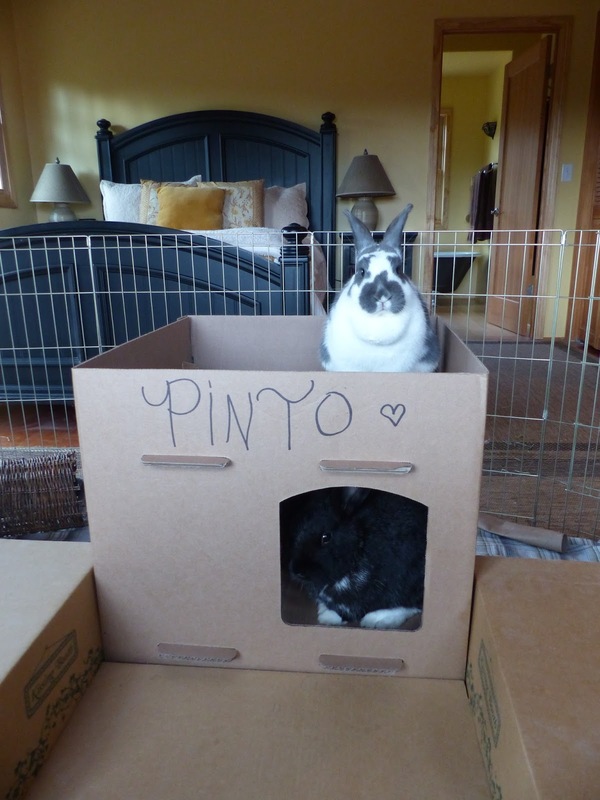 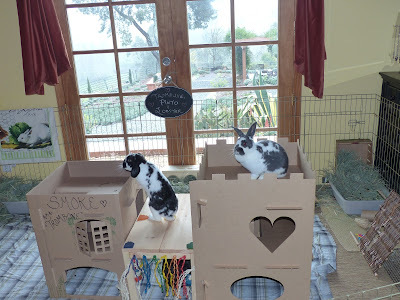 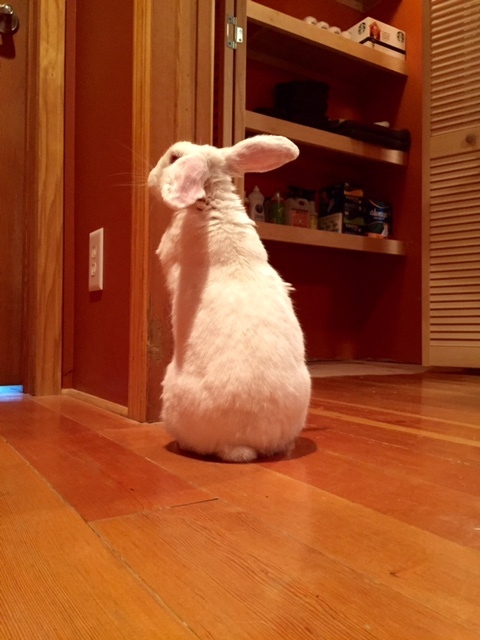 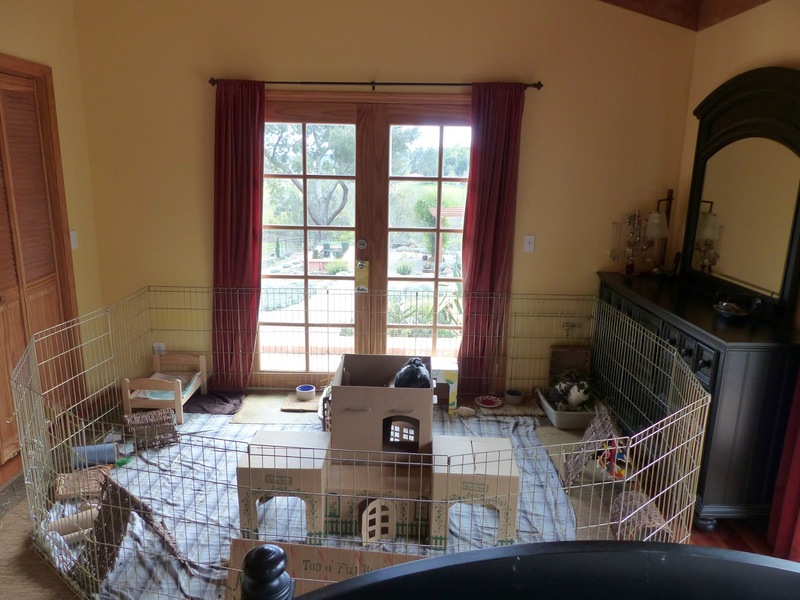 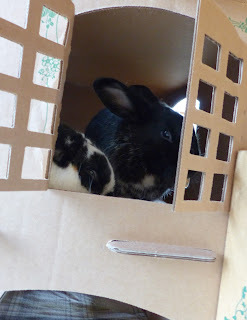 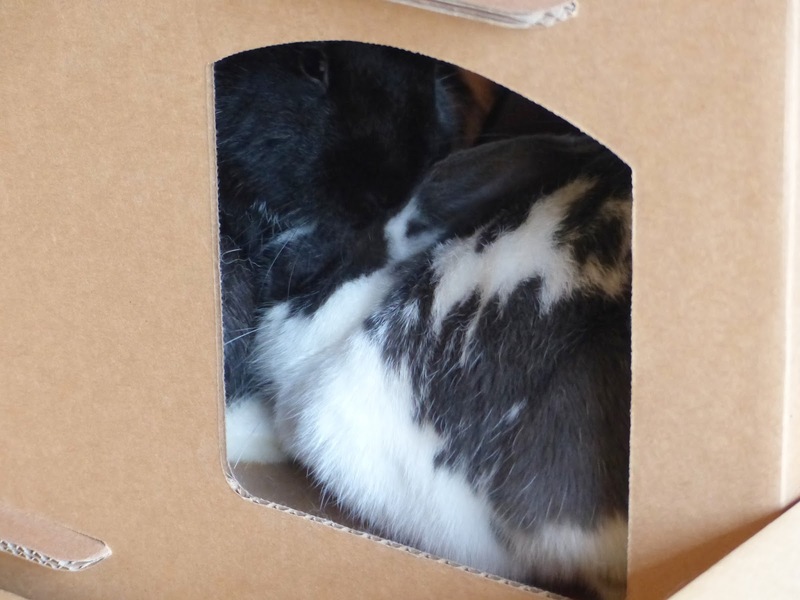 All the bunnies really love to peer through the cardboard windows! 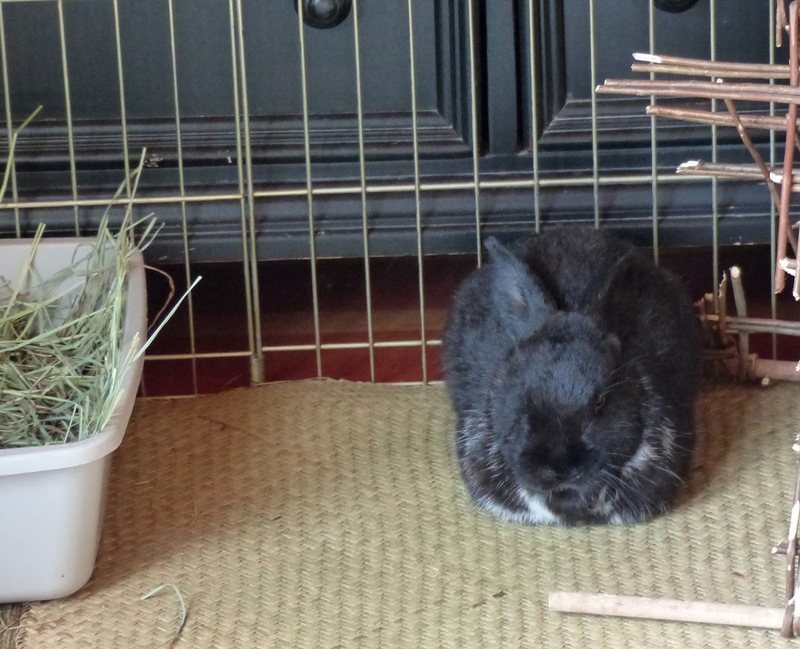 Trombone loves the wicker tent. 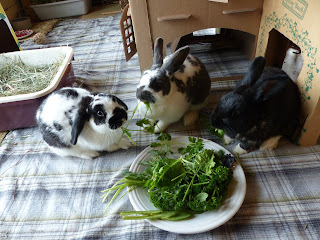 Salad time is a big hit! It's so much fun to walk into the room and find them together. 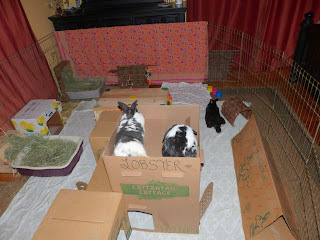 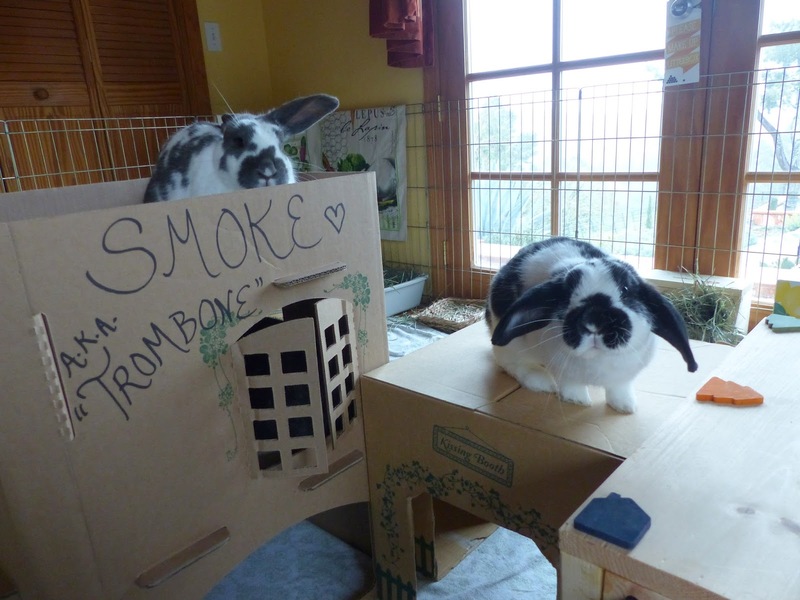 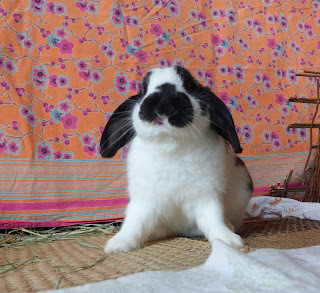 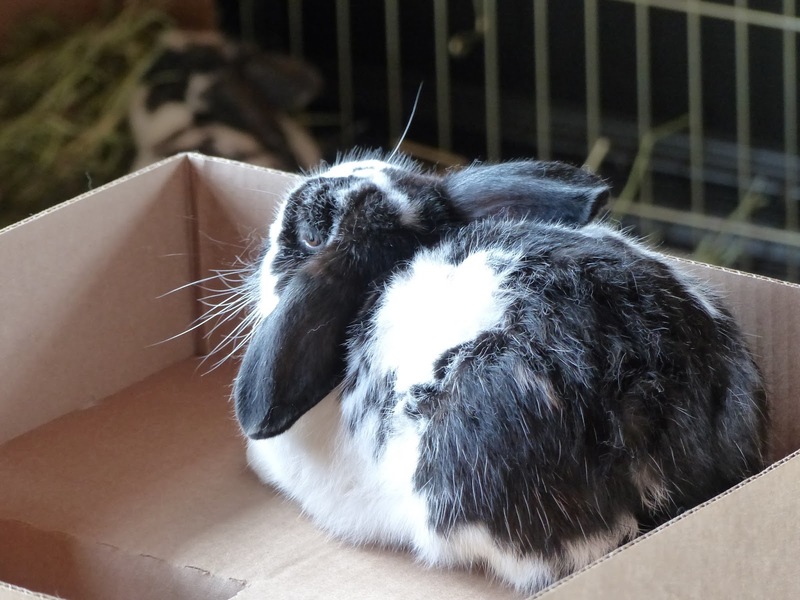 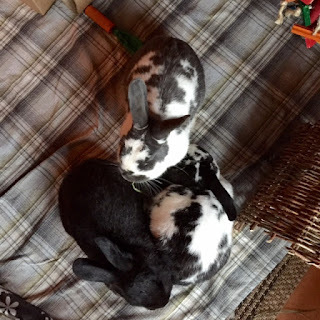 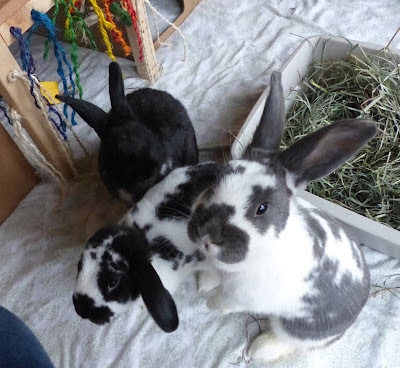 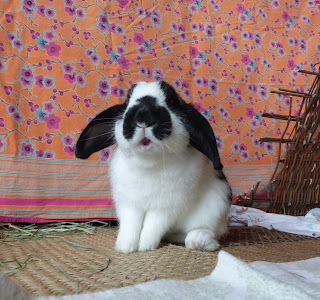 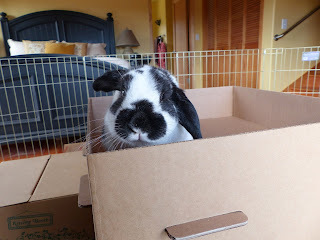 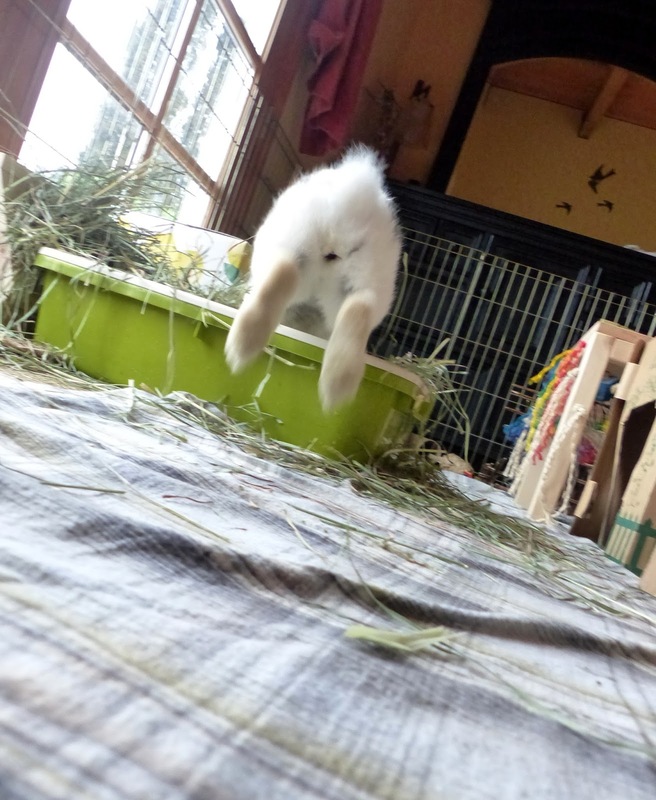 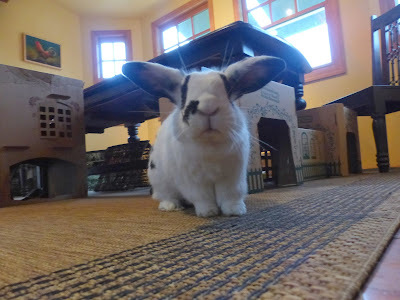 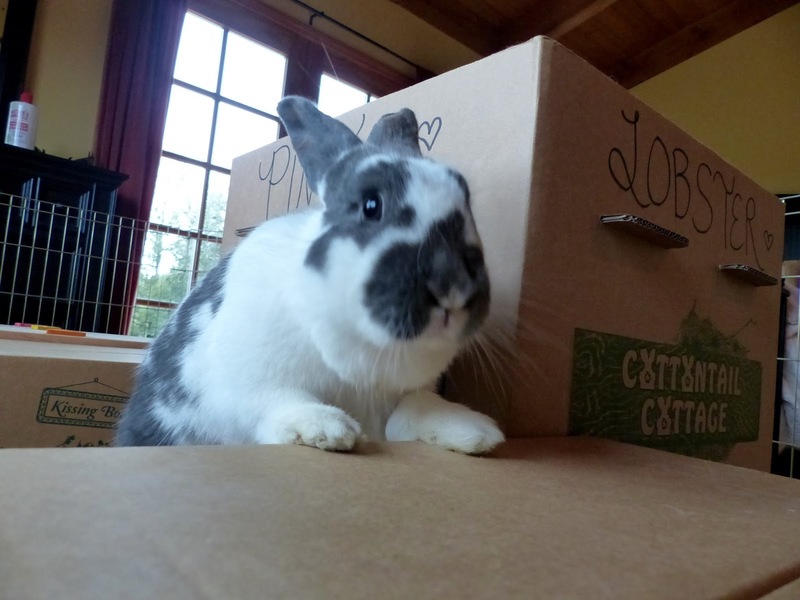 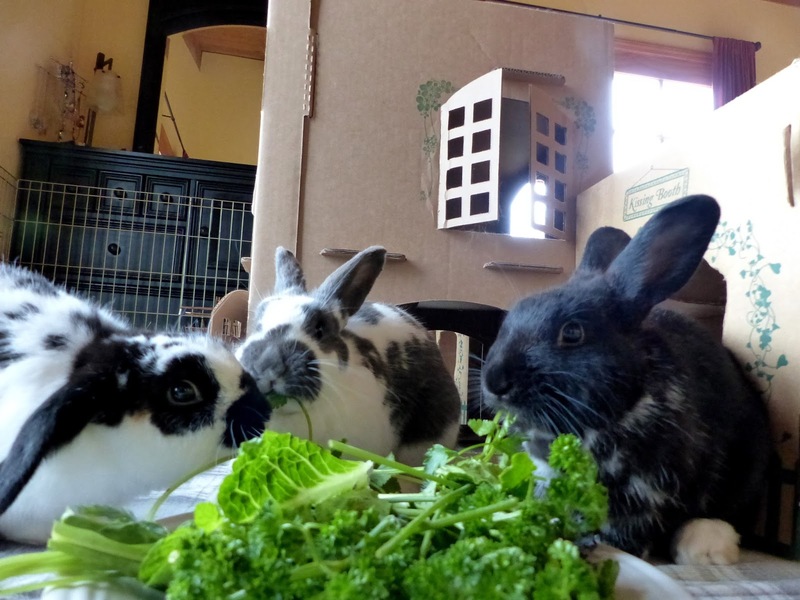 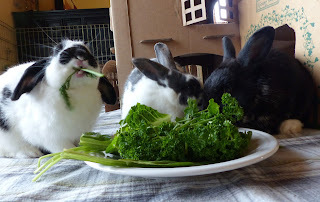 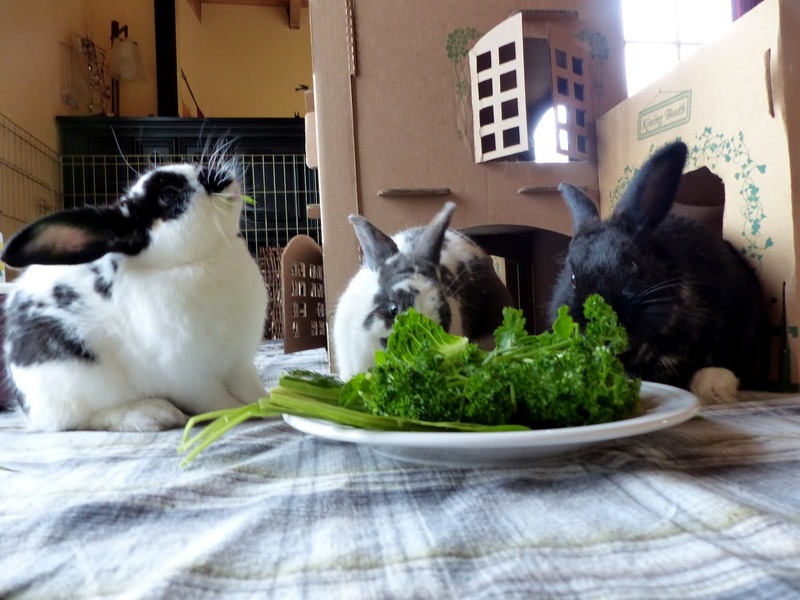 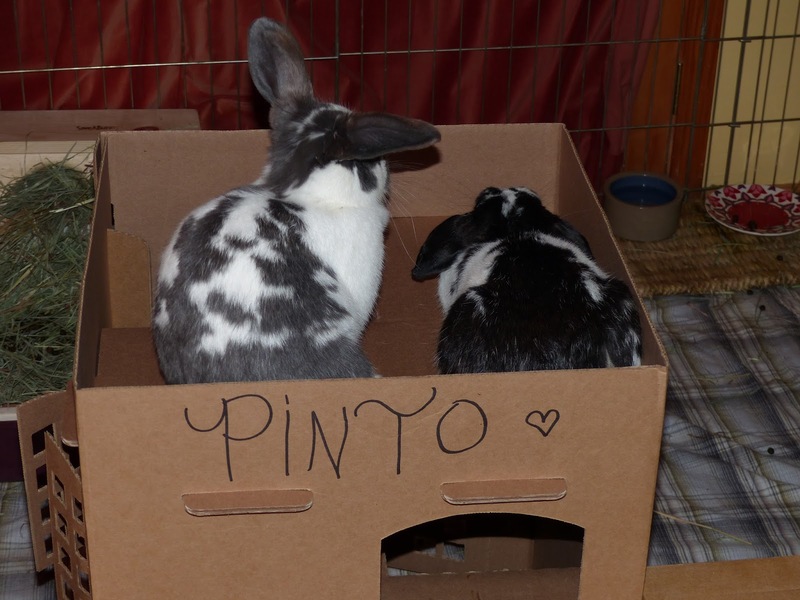 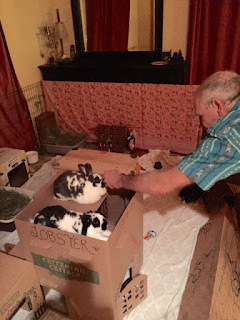 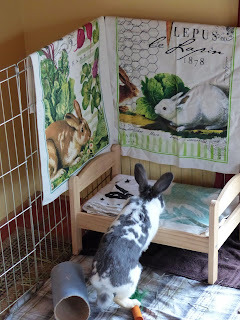 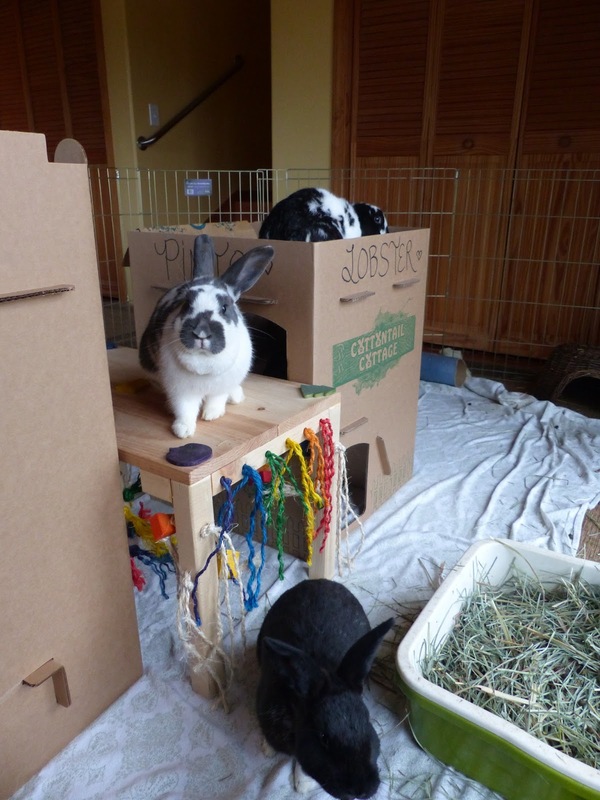 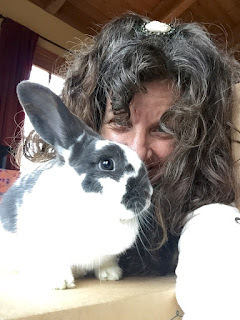 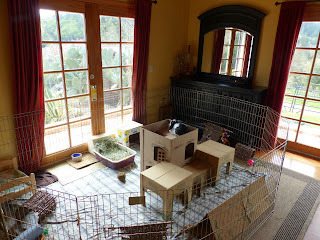 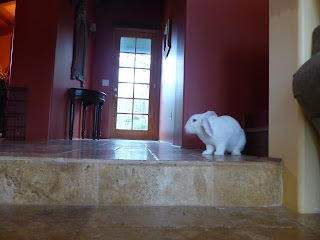 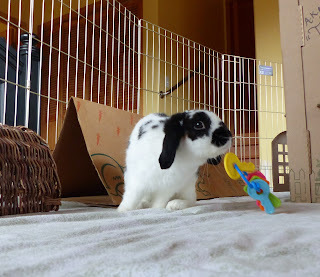 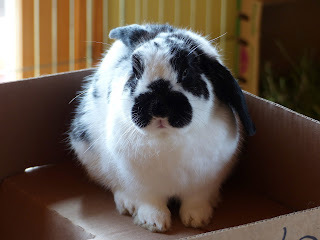 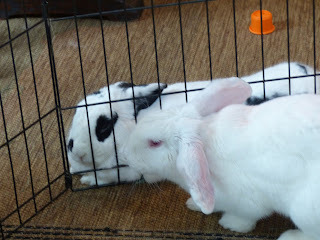 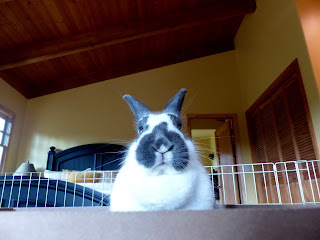 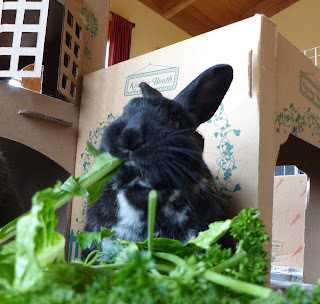 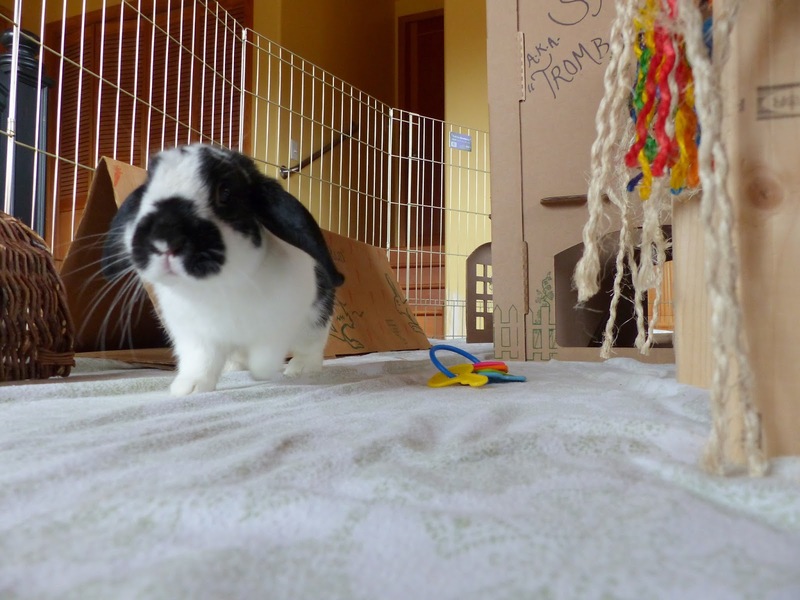 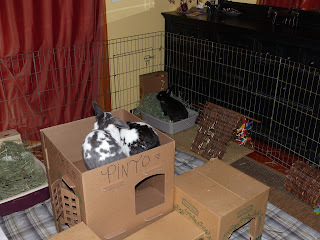 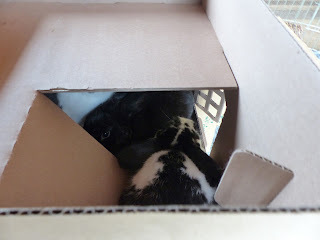 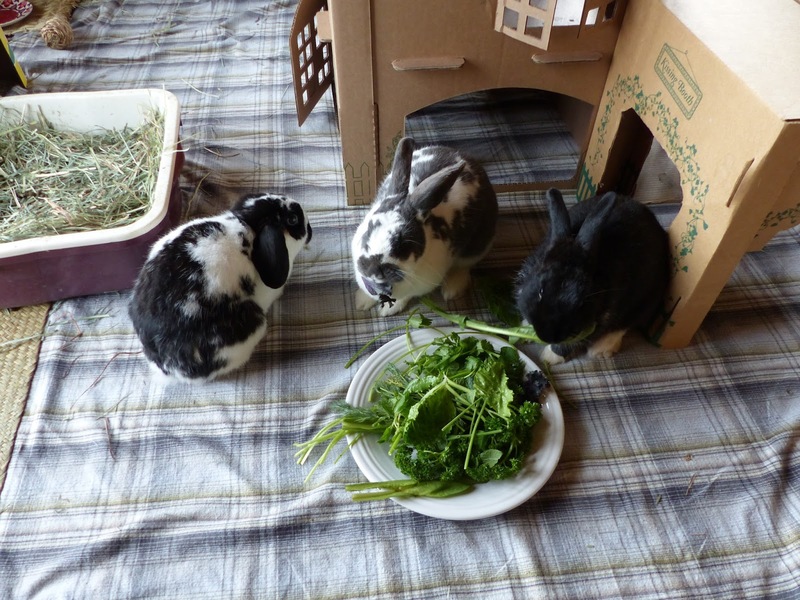 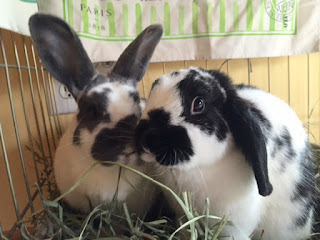 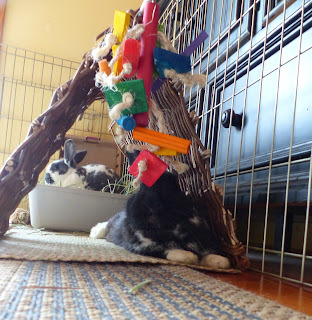 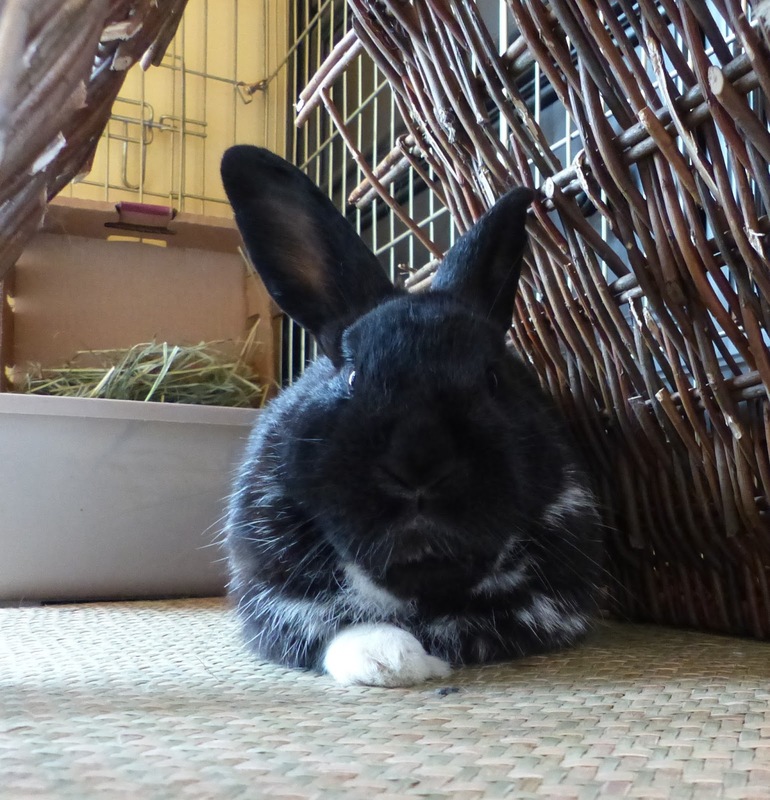 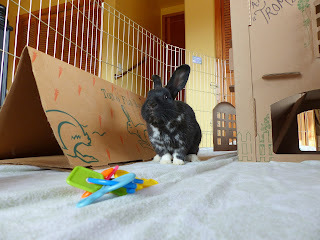 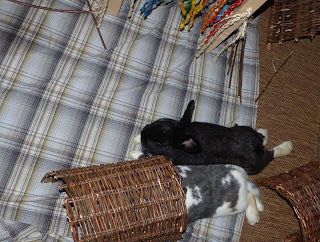 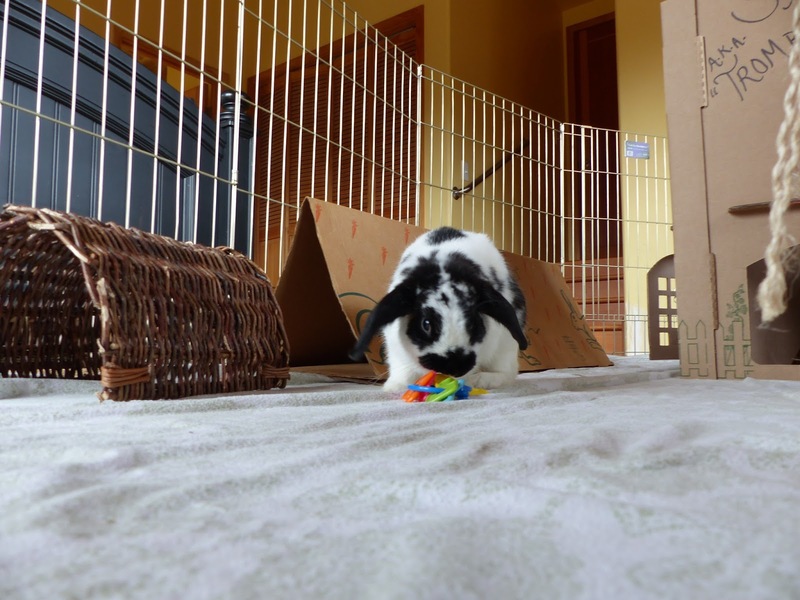 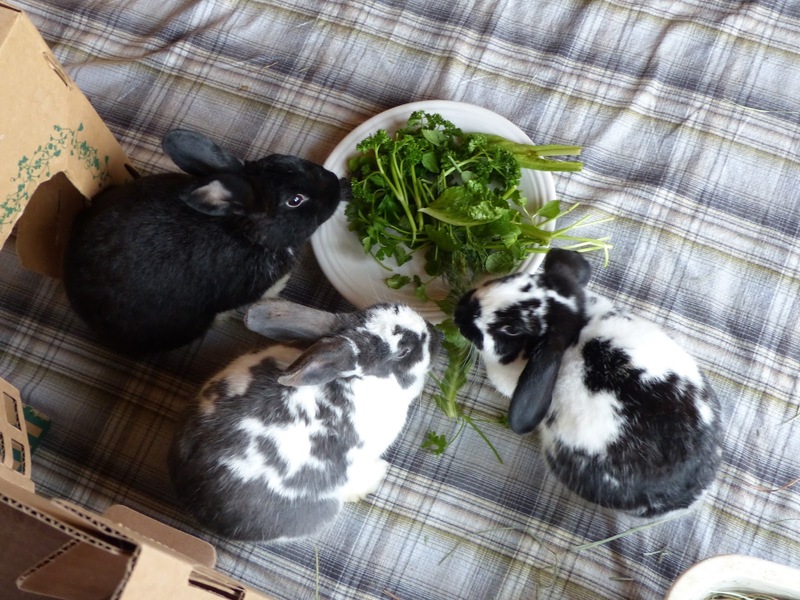 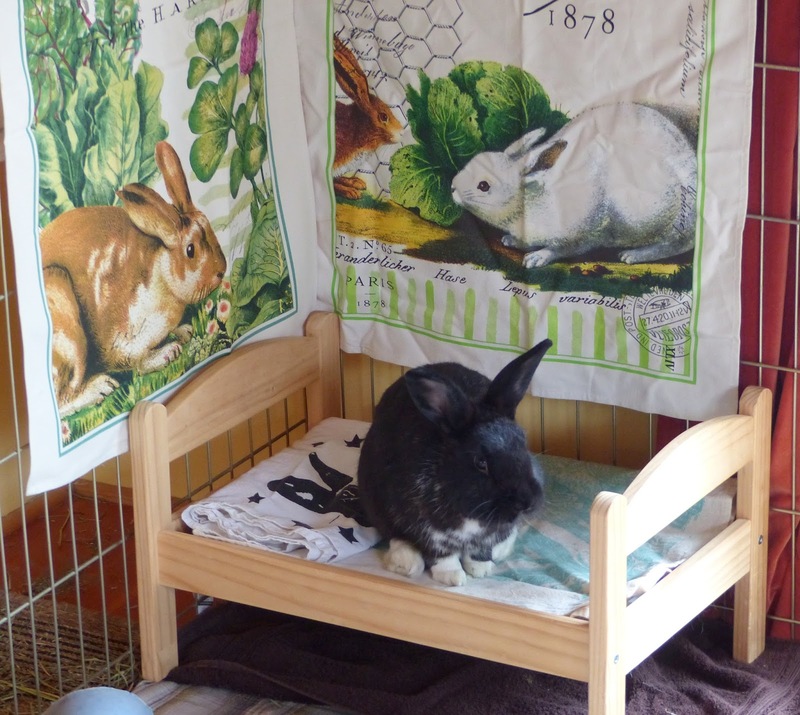 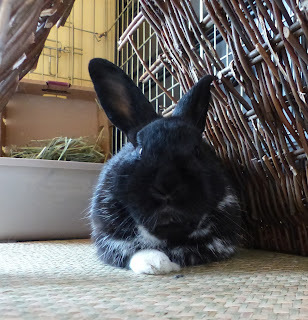 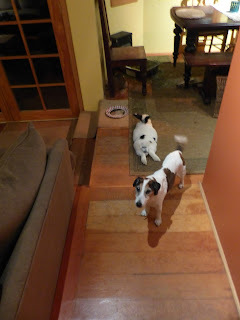 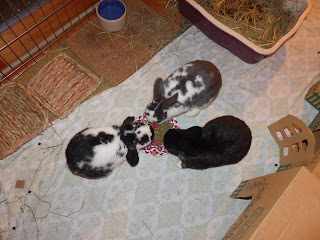 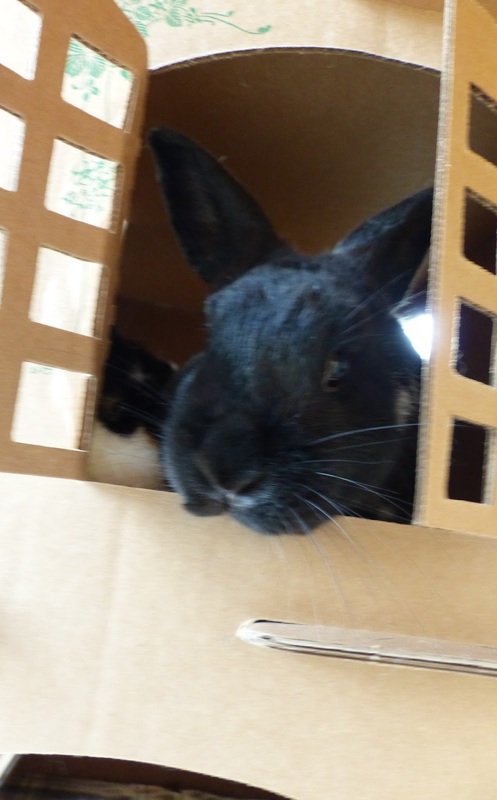 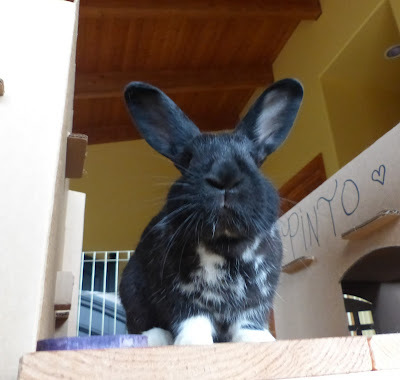 Yes, this week's blog post will be pretty much all about the foster buns. 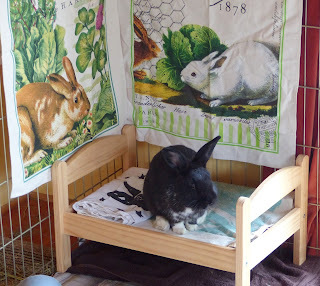 It has taken a week for me to settle into a routine and is definitely a bit overwhelming. 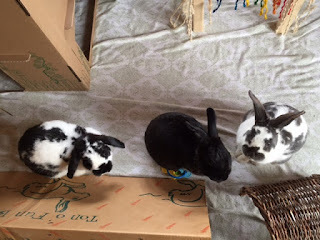 The rest of the crew also definitely know that something is up! 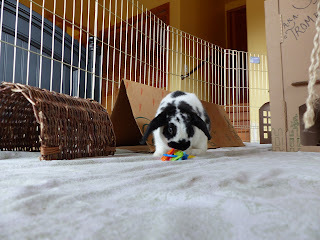 Lobster demonstrates how to toss the plastic keys! 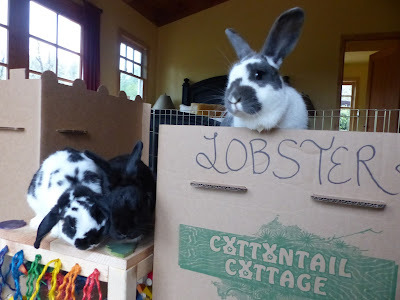 Lobster waits his turn to be groomed. 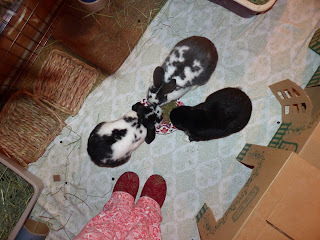 They also go crazy at breakfast time! 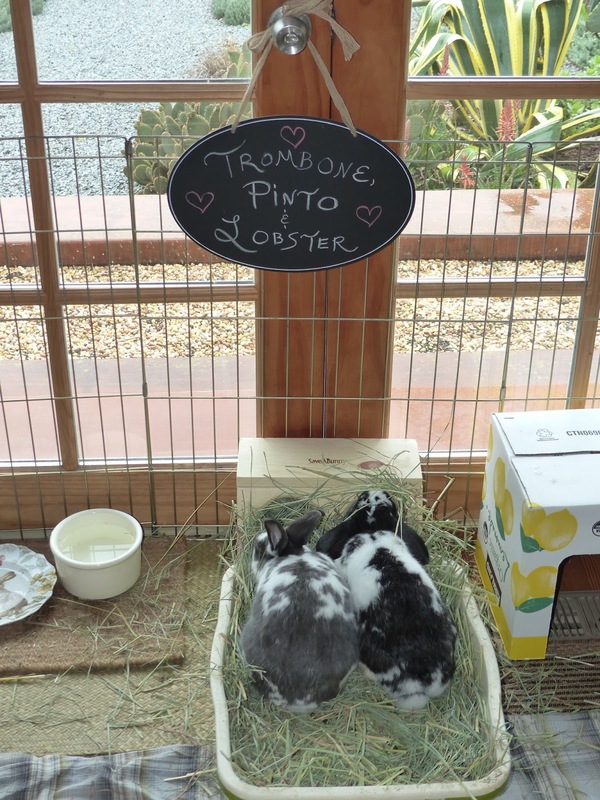 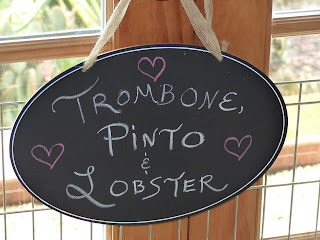 Lobster checking in with Trombone. Ah, finally - some of the regular crew! Of course they get their own sign. 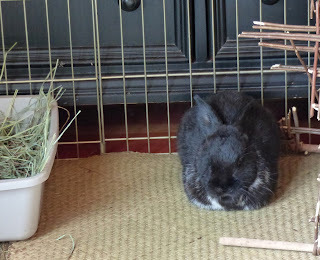 Wasabi is not that thrilled about getting a bit less of my attention. 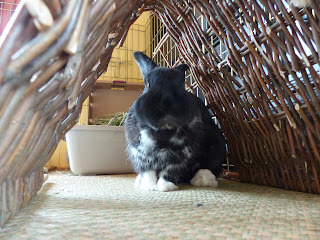 And Rufus has been "acting out" a bit, too - he went into the foreman's office and did a bit of wire snipping! 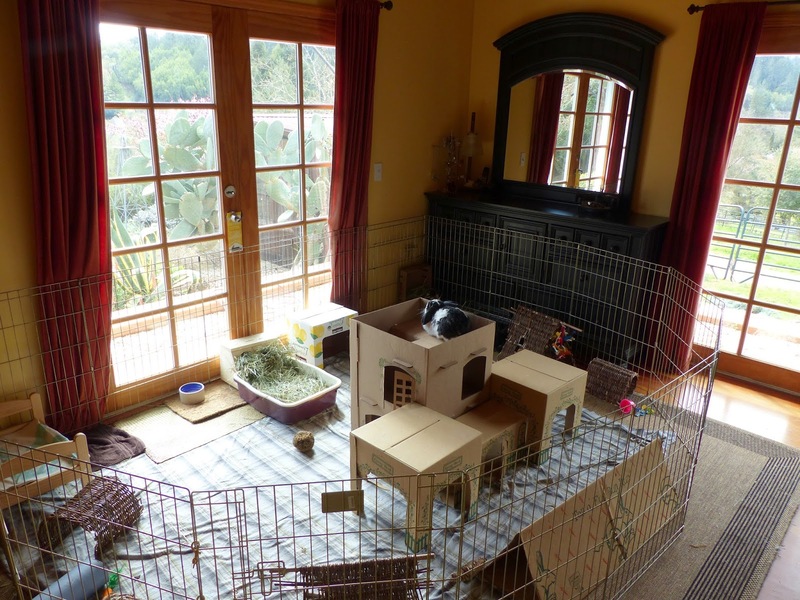 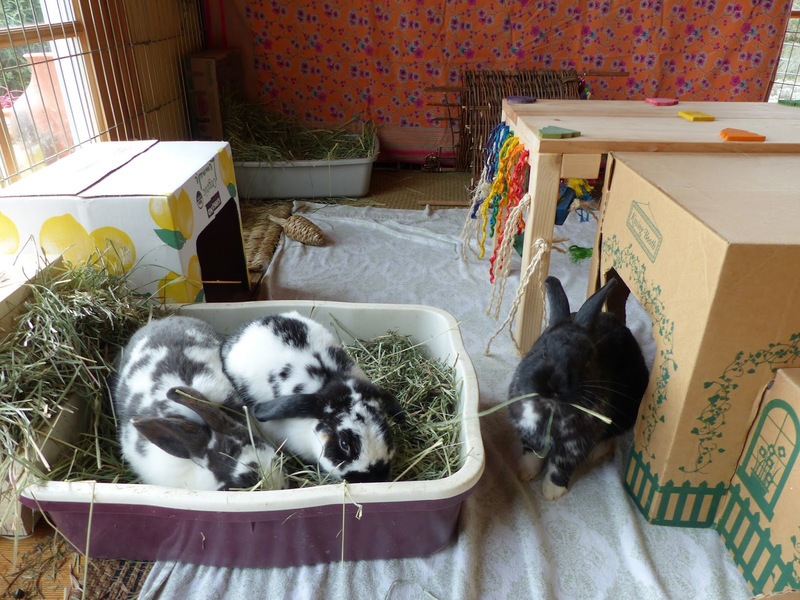 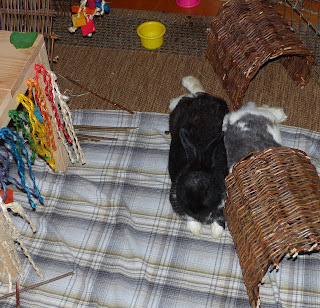 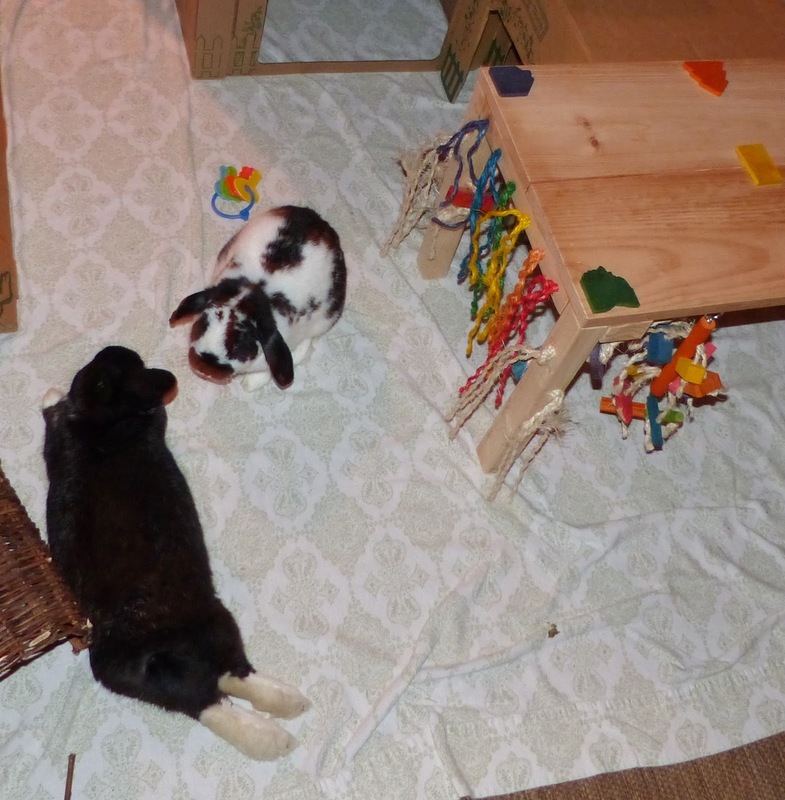 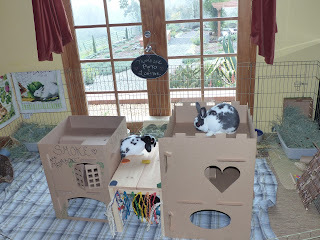 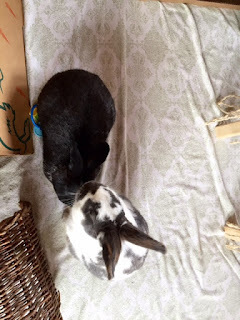 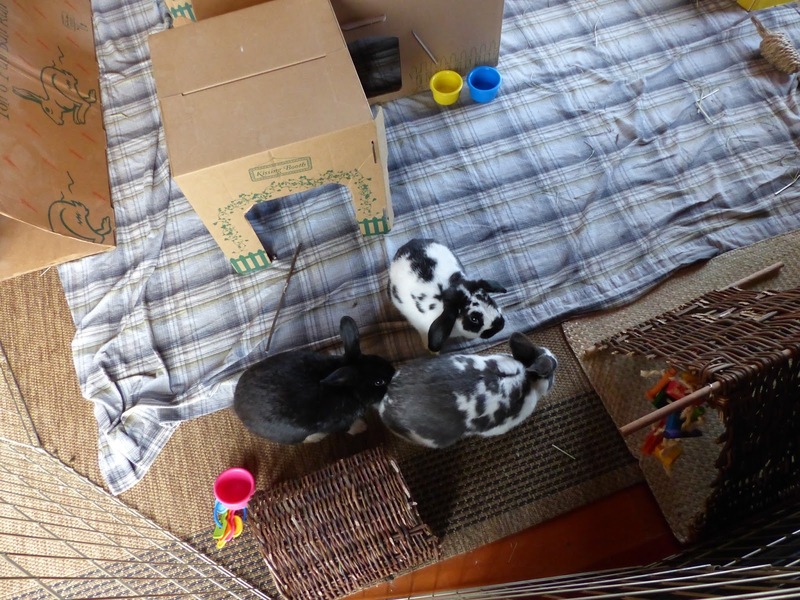 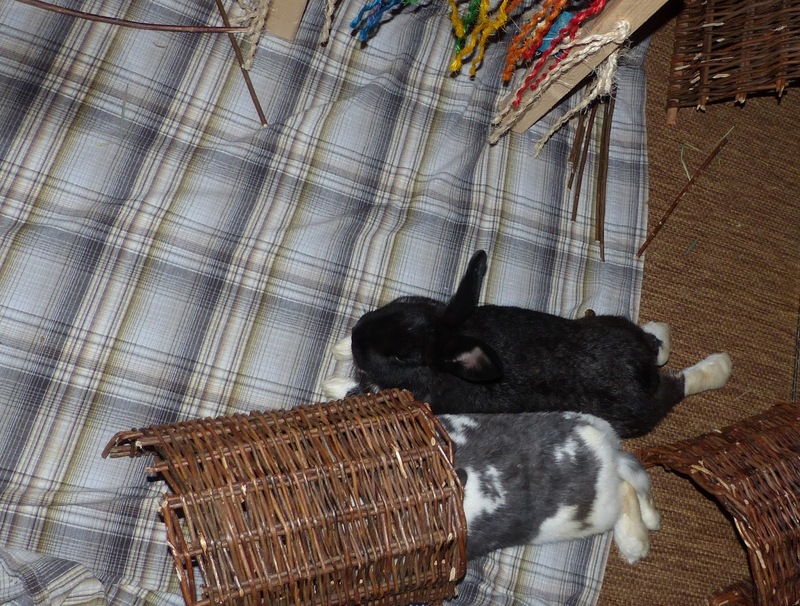 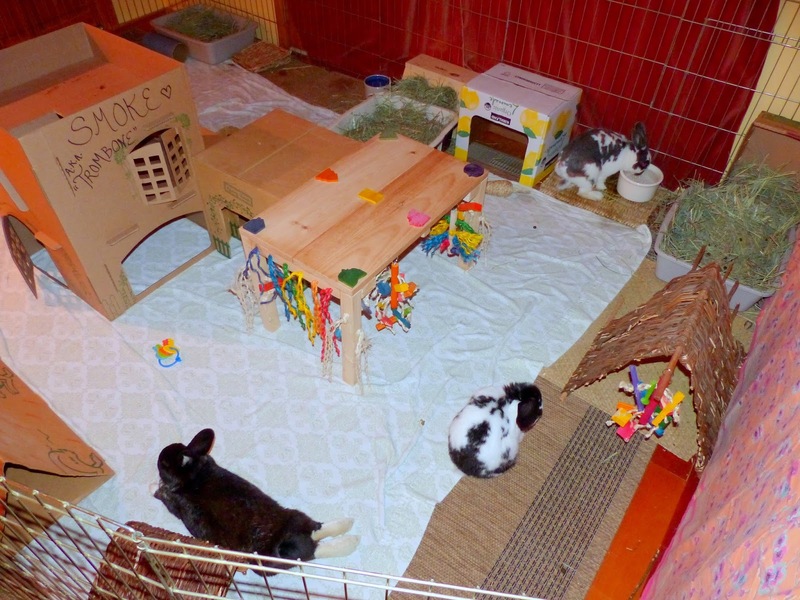 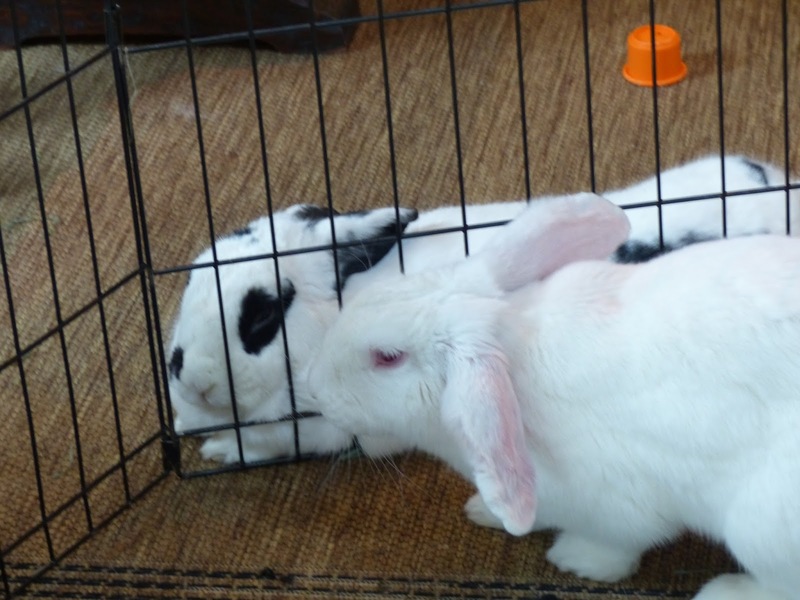 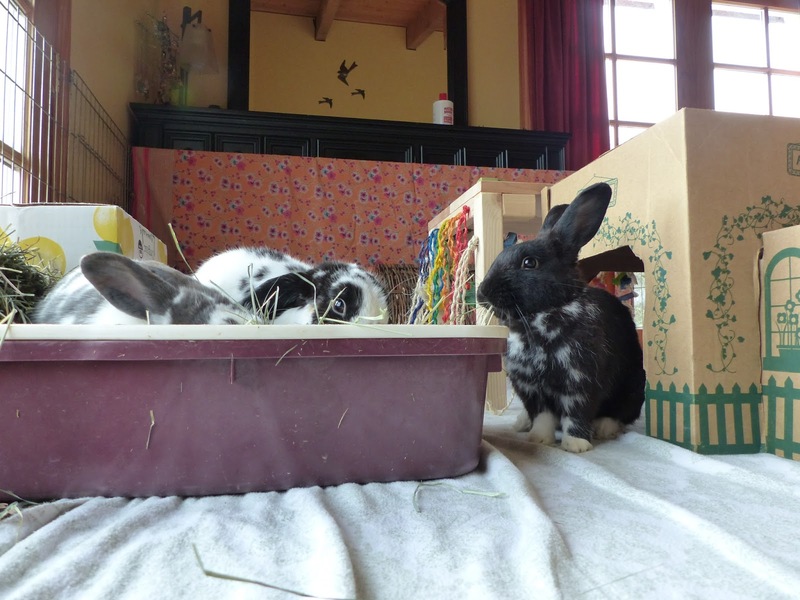 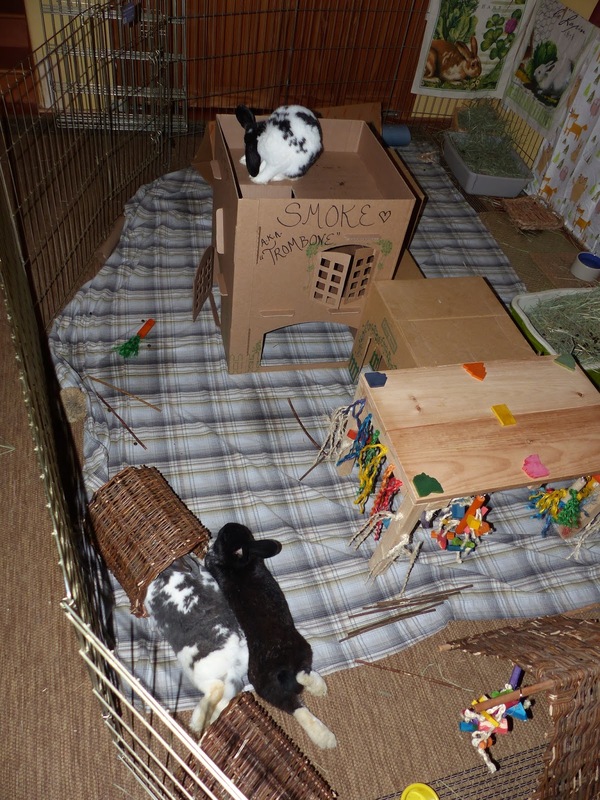 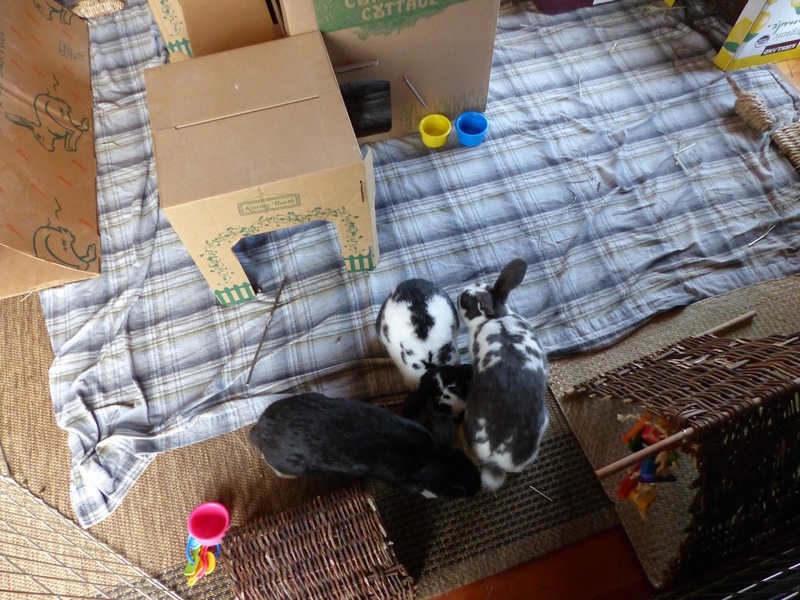 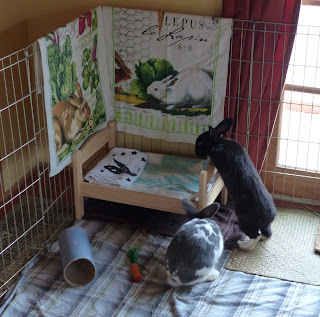 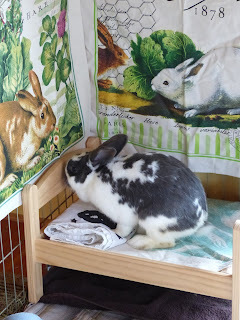 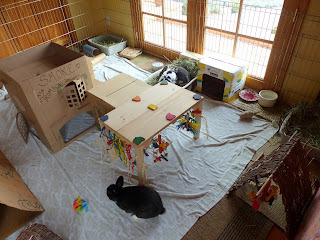 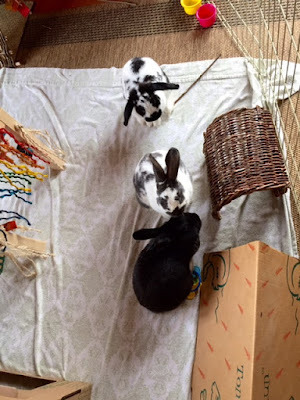 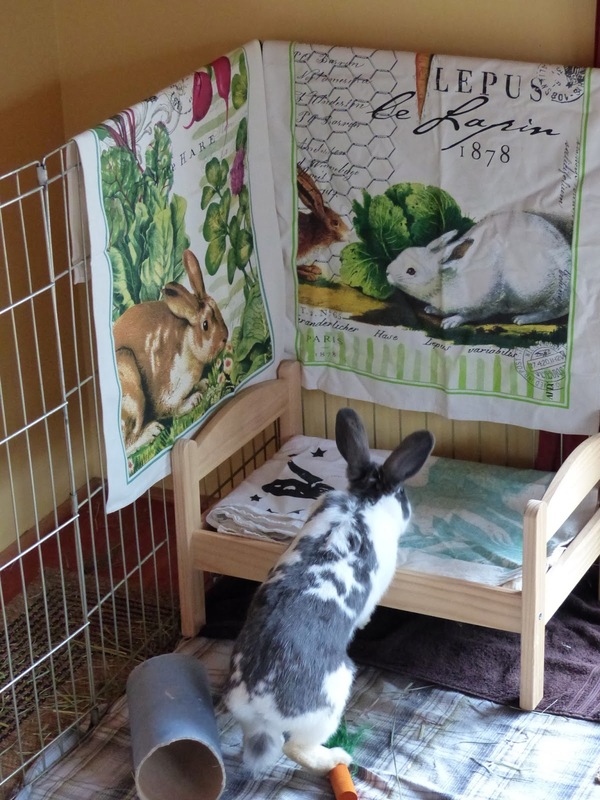 The resident buns discuss the foster imposters. Such a cute trio - fingers crossed they can be adopted out all together! 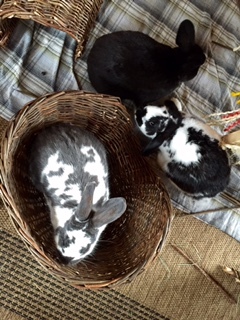 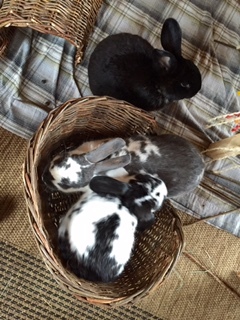 How many buns can fit into a basket? Meanwhile, Rufus tried his best to open the door to the bedroom! 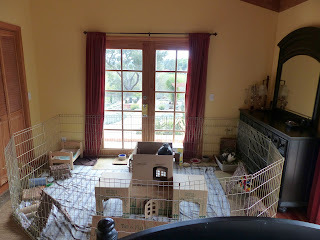 In other news this week, we had some rainstorms! 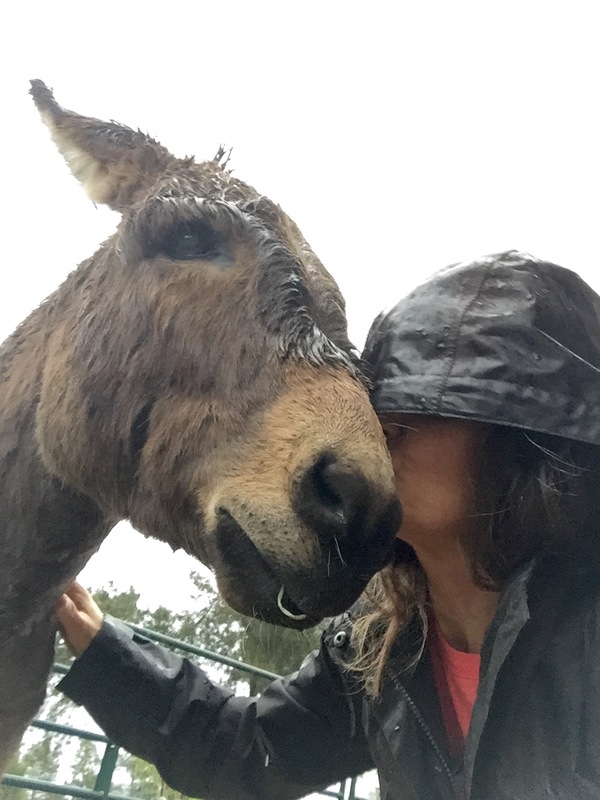 The weekly (wet) pose with Paco! 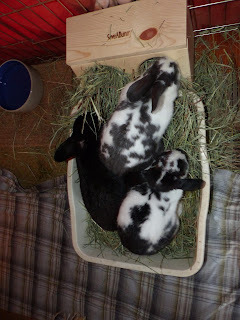 Even though there are three litter boxes in their area, some times the foster buns like to all cram into one! 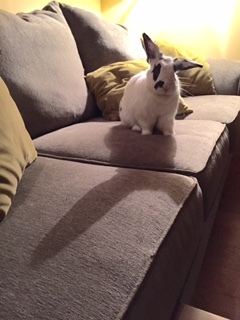 Wasabi helped herself to the couch this week...literally (she chewed a nice big hole!). 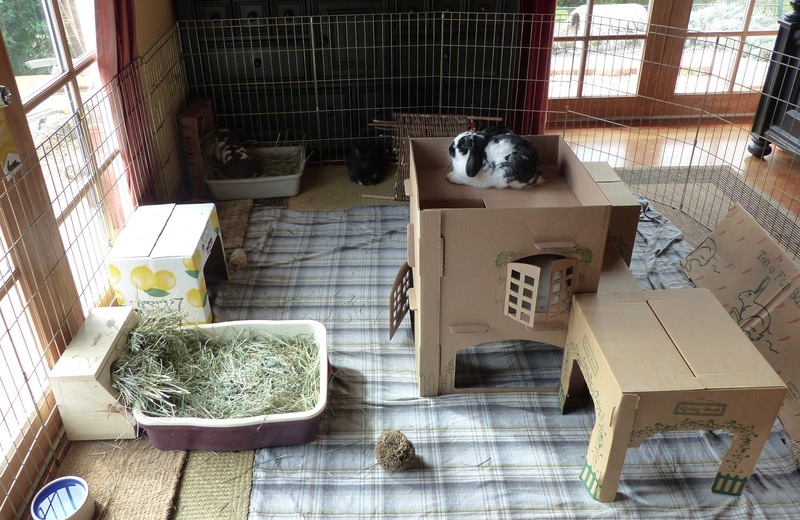 The boys were happy to have a dry barn to go to this week. The usual crew waiting for salad time. 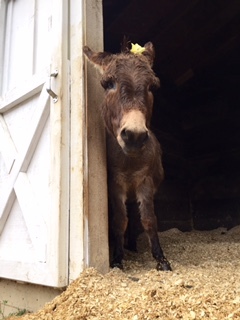 Paco with a daffodil behind his ear! On next week's blog I promise there will be more photos of the RESIDENT Lazy Vegan animals!